Special 4-2 is the Ghost House of Special 4 in Super Mario 3D Land. It is based off World 4-4. The player starts out in a corridor and must run forward to start progressing. The player soon starts getting chased by a Cosmic Clone before coming across some invisible platforms. They then come across a P Switch that spawns some coins that lead to a Warp Box. After exiting the Warp Box, the player still is on invisible platforms, and they soon reach an invisible platform that has two Brick Blocks, the one on the right contains a Coin, whilst the one on the left contains multiple coins. The player then reaches an octagonal platform with five ? Blocks in the middle, the middle ? Block contains a Super Star, that the player can use to destroy the Boos and Tail Boo that spawn as well as the Cosmic Clone. If the player defeats the Tail Boo they receive a Statue Leaf. 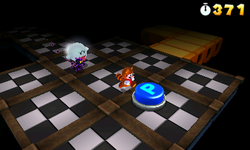 The bottom left part of the octagonal platform spawns one additional invisible platform that contains nothing, the bottom right spawns some invisible platforms that lead to a coin, the top left spawns two Boos, and the top right spawns some invisible platforms that lead to another Warp Box. The player then drops down onto more invisible platforms, that eventually lead to the Door. Outside, the player uses invisible platforms to reach the top of the Goal Pole. Star Medal 1: The first Star Medal floats above a gap in between two invisible platforms. Star Medal 2: When the player goes to collect this Star Medal, it moves move away to where the Boos spawn on the large octagonal platform. Star Medal 3: On a solitary invisible platform, the third Star Medal is near a wall. This page was last edited on April 5, 2019, at 18:22.